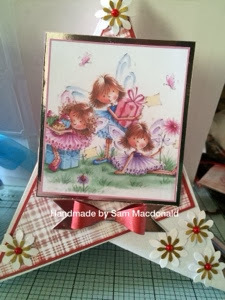 I got the card idea from a friend of mine called Franki as she ran a card class on Saturday last week. I used gold mirri card to put my topper on. And I used the embossing folder of the footballs and used black pen and used the small circle ephiphany tool to make footballs. Beautiful cards! Nice job on the footballs. 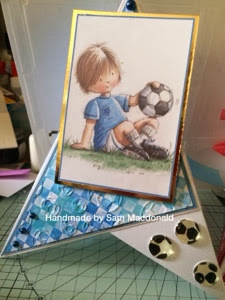 These are beautiful Sam, love the images and the card design. Fabulous creations Sam. Love them both. Two super little teepee cards, lovely colours and such sweet toppers. Great design.